Charl is on a short trip to the US, visiting DuPont as part of the SoC’s Year in Industry undergrad programme, as well as the Institute of Molecular Engineering at the University of Chicago to give a seminar. Both Tom and Charl were out and about today, giving talks. Tom spoke at the Xmas beamline user meeting in Liverpool on his TANI-surfactant structure investigations, while Charl gave a research seminar at the School of Chemistry in Leeds. Charl ran the Bristol 10K race on Sunday, the 5th of May, to help raise money for local charity BISC (or Bristol International Student Centre). He ran with a team of 9 other volunteers and international students, and was very pleased to have finished the race in just over 55 minutes. 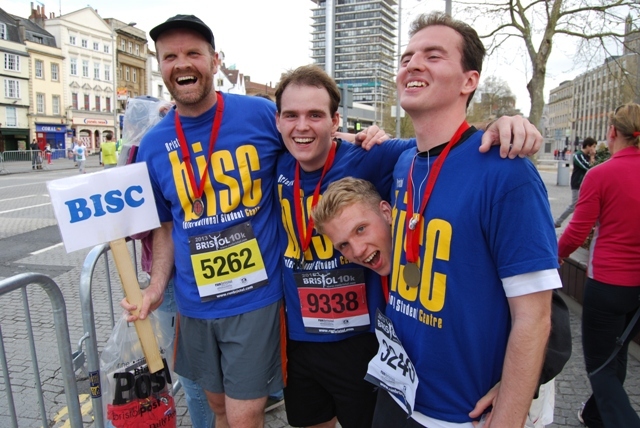 Here Charl is celebrating with other BISC runners after the race! Saravanan and Geri’s last working day and the farewell party at Townhouse, Bristol. Such a wonderful evening with the entire research group.